While the East Coast vs West Coast rivalry in Florida doesn't exactly hit Tupac/Biggie levels, it’s still there in spirit (or more spirits, as people love to barstool-argue about this). Yes, the East Coast has Miami and Cape Canaveral and Daytona and the Atlantic. But the Gulf Coast has more character, warmer water, and a swath of sand that stretches from the Everglades almost clear to New Orleans. Ignoring its beachside towns means missing out on some of Florida’s greatest gems. Here are four that stand out even in a state with 1,350 miles of coastline. The highlights: Throughout my childhood, my family made regular pilgrimages to Boca Grande to do what boatloads of people still do in ol’ Big Mouth: we caught tarpon. It took several close friends’ weddings for me to fully realize there’s more to this shabby chic barrier island town than snagging snook. Upon crossing the drawbridge to enter Boca Grande you notice cars giving way to bicycles and golf carts. The banyan trees cover the pastel home-lined streets, and the miles of sand stretch along the Gulf to a 19th-century lighthouse. Even the “Downtown” of Boca Grande is fit for a Nora Ephron movie, lined with bookstores, souvenir and bait shops, and ice cream parlors. Speaking of which, the food (seafood, particularly) is as fetching as it always appears in those movies, too. 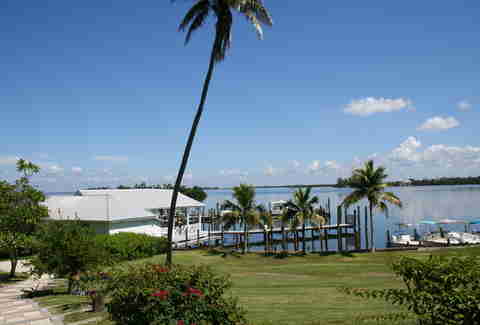 But Boca Grande’s real charm lies in its combo of seclusion and convenience. You feel miles away from civilization, and if you go there in the offseason you really might be on your own. Yet there you are, just two hours south of Tampa. Must eat/drink: If you opt not to stay at the pricier Gasparilla Inn, at least have a drink -- or three -- there in the bar or in the sunroom. From there you can walk over to their more casual restaurant, the Pink Elephant, for outdoor beers and a grouper sandwich. Your hangover cure awaits in the brunch at Third Street Cafe (lump crab cake Benedict, do it). Don't leave without: Strolling beneath the leafy canopy of Banyan St, a famous backdrop for photo shoots and engagement pictures alike. It’s Old Florida at its best. The highlights: Atlantic Coast loyalists, smitten with the aqua-green waters around the Bahamas and the Virgin Islands, scoff at the Gulf Coast’s dimmer hues. Well, Anna Maria screams, challenge accepted. The waters lapping against this quaint coastal island, near the mouth of Tampa Bay, give it the feel of the dreamier shots from Cast Away. It’s so clear, you can see the staggering amount of stingrays likely swarming you. 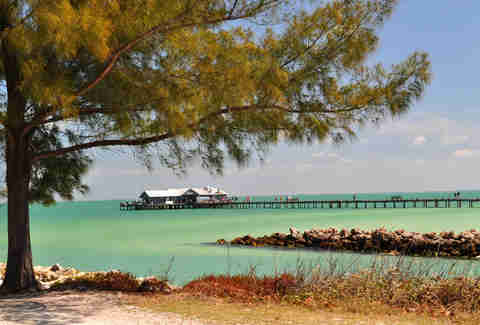 Anna Maria is also a major contender in best beach category. The never-ending soft white sand somehow never seems to be too crowded. You can follow the main strip, Pine Ave, across the island’s waist from sand to pier, stopping along the way for beachside bars, art galleries, and fish sandwiches. Must eat/drink: Sandbar is a must when you’re here, either for their jazz brunch, or sunset cocktails. Definitely hit up Poppo’s Taqueria for some wild boar chorizo tacos then sweeten the deal by making your own custom donut (bacon + crushed Oreo is a winning combo) at Anna Maria Donuts. Don't leave without: Taking your picture outside the windowless, doorless, roofless Anna Maria Jail. It’s not a real jail anymore, and it sorta never was, strictly. It served more as an overnight holding tank, apparently, where miscreants would get so mosquito-chewed they’d never act up again. So, yeah, how can you not see this? The highlights: If Cabbage Key were a car, it would be a Land Rover Defender. Just off Pine Island, the 100-acre retreat is ideal for the off-roading adventurer, as it’s next to flat-out stunning (and only accessible by boat) Cayo Costa State Park. The 2,426-acre state park is lined with nine miles of sand, pine forests, and mangroves, a mecca for snorkeling, hiking, biking, shelling, boating, and scuba diving. We can’t promise you will see manatees and dolphins, but yeah, you probably will. Cabbage Key also might be responsible for “Cheeseburger in Paradise.” The Cabbage Key Inn, a 1920s-era house transformed into a local landmark, apparently inspired Jimmy Buffett to write this extremely underplayed diddy. These days, dollar bills left in tribute cake the walls -- the establishment supposedly collects 10,000 of them a year. Must eat/drink: This a small place, so Cabbage Key Inn, with its cheeseburger fit for paradise, is your go-to. If you don’t feel the urge, it also serves up shrimp, mojitos, and Key lime pie. Don't leave without: Touring the island’s perimeter by kayak. It’s really the best way to capture, and literally see, the entire place. The highlights: When I grew up in Tampa, you went to St. Petersburg for only three things: visiting grandparents, a field trip to the Salvador Dalí Museum, or the occasional Tampa Bay Lightning game. These days, St. Pete is becoming the Brooklyn of Florida -- scruffier, edgier. Even before it became trendy, there was always Pass-A-Grille: a one-block-wide beach town located at (just) the tip of an island right off St. Pete. Like some of the more remote Florida Keys, this teeny place packs in a bevvy of art galleries and local breweries. Its sunsets can beat up your sunsets. And since this is one of the least-developed islands of St. Pete Beach / Fort De Soto Park, it’s great for exploring some of the state’s most sought-after nature preserves (including Egmont Key). Must eat/drink: Grab gator bites and a Gulf Coast cocktail at the Hurricane Seafood Restaurant to watch the sunset from the 360-degree-view rooftop. 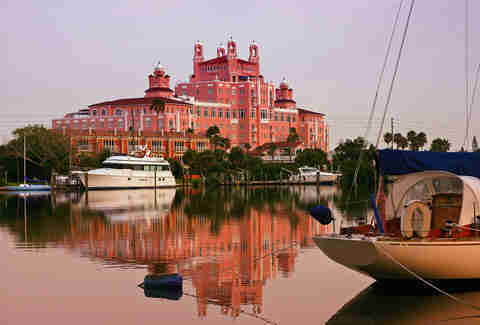 If you’re really looking to doll up your Florida vacation, head nearby to the gargantuan Pepto-pink Don CeSar Hotel for oysters, snapper, and lobster at the beachside Maritana Grille. Don't leave without: Knocking back an Evander Beer. Legendary local artist Evander Preston is such badass he got his own pilsner-lager, brewed across the state in Melbourne. You drink it, you’re automatically a shade cooler.